When the weather turns inclement I resort to waterproof over-trousers or textile trousers to stay dry. The biggest downside with these is the slipping around on the seat. Whether wet or dry, I kept finding myself sliding forward every time I brake or sharply cut the throttle. Being fairly tall, I sit a little way back from the tank on my Fazer to remain comfortable and stop my legs getting too cramped up on the pegs. No matter how much I grip the tank with my legs, when wearing textiles I just slide forward and down right up against the tank and then indistinctly grip the bars really tight. I feel unstable and my tense grip on the bars is detrimental to my riding, especially in the wet. Perched close against the tank, my legs feel squashed and uncomfortable on the rear brake and gears. Meet the Triboseat, a super grippy cover for your bike seat. 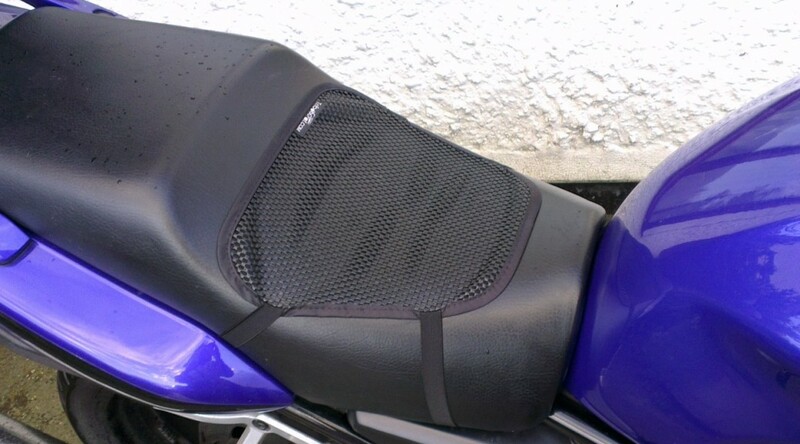 Triboseat predominantly sell bike specific seat covers to help your pillion remain still, preventing them sliding into the back of you. 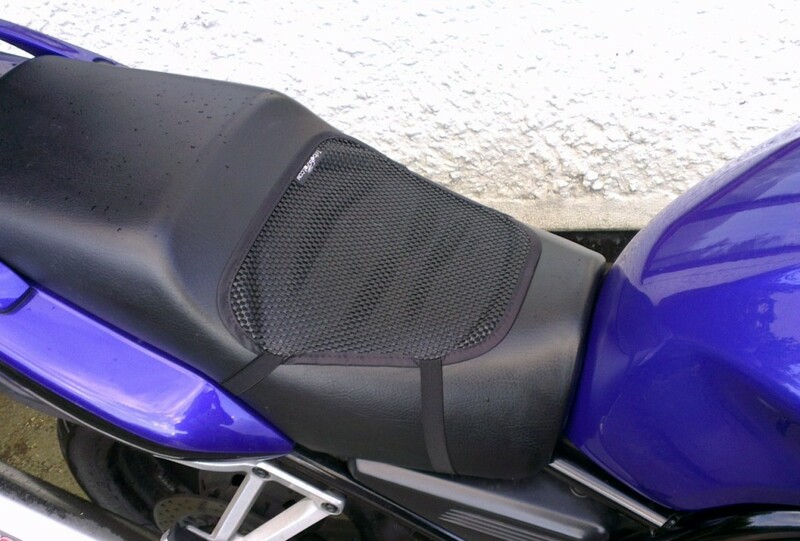 However they also sell The Rider, a generically shaped cover to keep the rider planted on their seat. Sounds like exactly what I need. A few days after ordering, the Triboseat cover arrived in a flat white envelope. It’s comprised of a small patch of super grippy material which has a couple of clip straps to go around under you seat. it has a neat trim around it and just a little Triboseat label. my arse remained perfectly still on the seat, the Triboseat Rider did exactly as it said on the tin. Looks wise, it’s not particularly great, like you’ve just strapped a random bit of mesh to your seat. The pillion Triboseat covers look a lot better as they continue around and under the seat with only the front edge on show. A whole seat cover design with no seam or straps on show would look at lot better. But at just a mere £13, it’s pretty good value considering functionally, it does the job well. I have only used the Triboseat Rider for a couple of days, so expect an update here in the future with regards to it’s longevity. Epilogue: Nearly 2 years later I’m still using this Triboseat whenever I’m wearing textiles. It’s held up fairly well, one clip bust (got squashed under seat) and the elastic straps has stretched a lot, such that I’d had to tie some knots into them to get them short and tight enough. Otherwise it’s doing grand and doesn’t look too tatty. More details on The Rider at the official Triboseat website. Do you think it would stop chafing?